Combine potatoes, water and butter in slow cooker sprayed with cooking spray; cover with lid. Cook on HIGH 3-1/2 to 4 hours (or on LOW 6 to 7 hours). Microwave milk in microwaveable bowl on HIGH 2 min. Add to potatoes along with the sour cream and pepper. Mash until smooth. Add 1 cup cheese; stir until melted. Top with onions and remaining cheese. 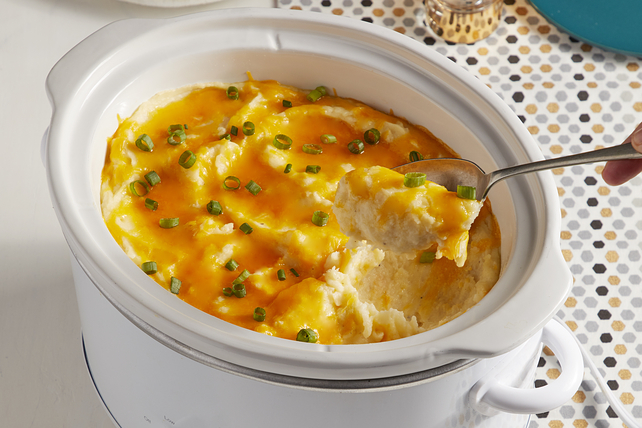 These creamy cooked Slow-Cooker Mashed Potatoes can be held in the slow cooker set on LOW for up to 1-1/2 hours before serving. Serve this potato side dish with a crisp, mixed green salad or hot steamed vegetable and cooked lean meat, poultry or fish. For easy cleanup, line the slow cooker with a disposable plastic liner before using as directed. When mashing the potatoes, be sure to use a hand-held potato masher to prevent the liner from tearing. Substitute 1/4 cup chopped fresh chives for the sliced green onions.